I spotted this on a wall in a subway the other day. The Osaka Yosei-kai (Performers Training Association) has issued its annual performers call for applications. 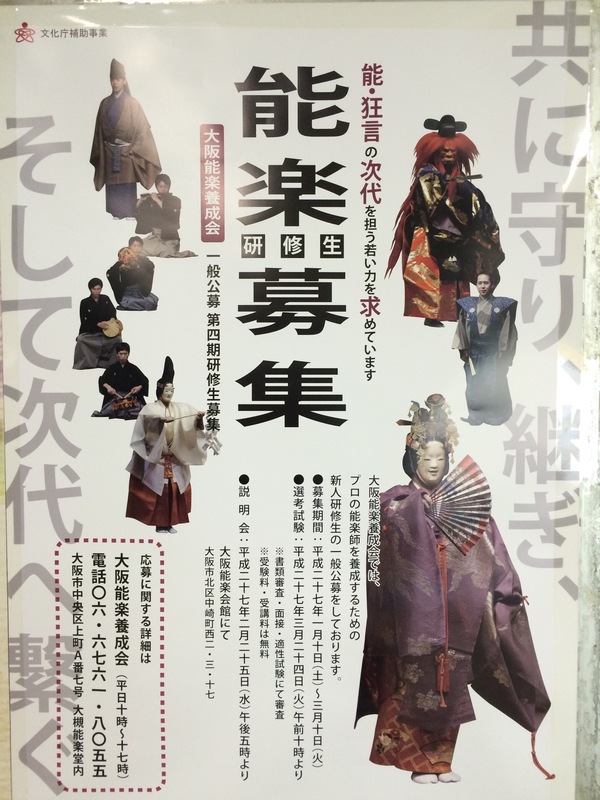 If you wish become a Noh or Kyogen professional, but you were not born within a family of professionals, you can apply to one of the courses the Yosei associations active in different areas of Japan offer. In order to apply you have to be a healthy individual between 15 and 23. There are two type of courses: one is reserved to those who can solely concentrate on practice, another to those who must also attend school, or have a day job. The Yosei-kai is one of the few Noh activities sponsored by the Japanese government via the Agency for Cultural Affairs. Bounden is a new iPhone app created by Dutch design shop Game Oven and developed by Ernst Meisner of the Dutch National Ballet. Basically, it’s a game meant to be played by two people simultaneously holding the iPhone. Players have to follow a path on a sphere that rotates according to how the iPhone is manipulated, resulting in a sort of dance duet. the app makes good use of the iPhone on-board gyroscope. Bounden is ‘just a game’, but it is interesting to see portable technology increasingly allowing us to engage with artistic practice that are not only music and drawing, which you can do sitting at your desk, but also performing arts that require us to move and to interact with other bodies. I have no trouble (kinda) seeing myself dancing alone in a studio, while Google Glass, Oculus Rift or whatever similar technology will be available in the future, shows other performers, or a sparring partner, or the shadow of my teacher on the glasses surface. These days I am preparing for the tsure (companion) role in the Noh Yuya. I have performed a similar role in the past, albeit as a male character, and I am familiar with some of the chant and movement sequences, so instead of having a usual utai chant class to introduce the piece, my training started out as tachigeiko (standing lesson), where actors go through movements and chant on stage while holding the katazuke (score) in one hand in order to keep an eye on it. I have sometimes performed a kind of self-tachigeiko on my own holding a small tablet in one hand, where I playback videos I took in previous lessons. I literally dance as I watch the screen. (Warning: this is a rather ‘advanced’ technique that I do not recommend if you have not mastered the kata movements, as you are likely to misinterpret the video which was forcibly taken from a point of view which is not the one you have on stage.) With wearable technology developing so quickly, I can only wonder what kind of instruments we will use in our dance practice, say, in five years time. I am not entirely sure all the change it will bring will be for the good, but we will need to deal with that anyway. When I introduce myself or talk about my training in Noh, I often find myself in need to explain what I mean by ‘Kongō school’ (金剛流 Kongō-ryū). There is a common misunderstanding deriving from the use of the word ‘school’ (or it. scuola; fr. école; ger. Schule – it extends to all European languages) as translation of the Japanese ryū. Since many have asked me to explain what exactly a ‘Noh school’ is, I would like to use this space to clarify a couple of things regarding this matter. The Kongō school, to which I belong, is one of the five stylistic schools of shite actors (the others being Kanze, Komparu, Hōshō, and Kita). ‘School’ is none other than a free translation of ryū (lit. ‘current’, or ‘flow’), a word defining a performance style peculiar to a certain group of actors who are organised in a ‘guild’, a pyramid structure on top of which is the iemoto (lit. ‘foundation/origin of the house’). These ryū are the contemporary configuration of troupes of performers called za, which emerged in the Muromachi period, and that later underwent a process of professionalisation that led to the creation of ryū specialised in particular roles and instruments. Various styles, or ‘ways of performing’ a specific element of Noh become formalised during the Edo period, multiplying the possible combinations of chant, dance, drum and flute performance when these elements come together on stage. In fact, one of the difficulties performers need to face is getting used to a variety of styles in order to be able to perform with more than one ryū, because all performing roles (as shite actors are grouped in the five ryū mentioned above, waki, kyogen, taiko, ko-tsuzumi, ō-tsuzumi, fue – all have different ryū). For example, a Kongō-ryū shite could perform with a Fukuō-ryū waki or a Takayasu-ryū waki, with a kō-ryū or okura-ryū ko-tsuzumi, etc. (However, ryū are not represented equally across the territory, which makes it so that some ryū always get to perform with a certain other ryū more often than others… it’s getting complicated… I might need to write another post to explain this). Anyway, each ryū has a iemoto on top of it, and his (male) heirs immediately under him. However, ryū are also composed of other families which have been affiliated with a certain ryū, and might to some extent have developed a particular ‘style within the style’. Although dependent to the iemoto supreme leader, such families achieve a certain degree of independence which has often led (and still leads) to power struggles within the ryū. The obvious example is the Umewaka family, a formerly independent group which were incorporated into the Kanze school at the beginning of the Edo period (early seventeenth century). When, at the beginning of the nineteenth century, the Umewaka family attempted to declare independence, it was excommunicated from the Kanze school by the iemoto, only to rejoin a few years later. Disputes like this are common in the history of Noh, and still continue today. In short, a ryū is a conglomerate of individuals, some of whom are descendants of families that have been in the Noh profession for generations, while others are associates of these families – they can be amateur students who turn to professionalism, or relatives adopted into the professional family. The iemoto family, from which the style takes the name, is the highest ranking within the school. The iemoto himself, as the ultimate leader of the school, holds the rights to grant teaching licenses, to authorise performances, to revise and publish scripts (hence to earn publication revenues), to accept and to expel members, etc. This is to say that a Noh ‘school’ is not an educational institution like a drama academy, with lectures, practice rooms, recitals, etc. 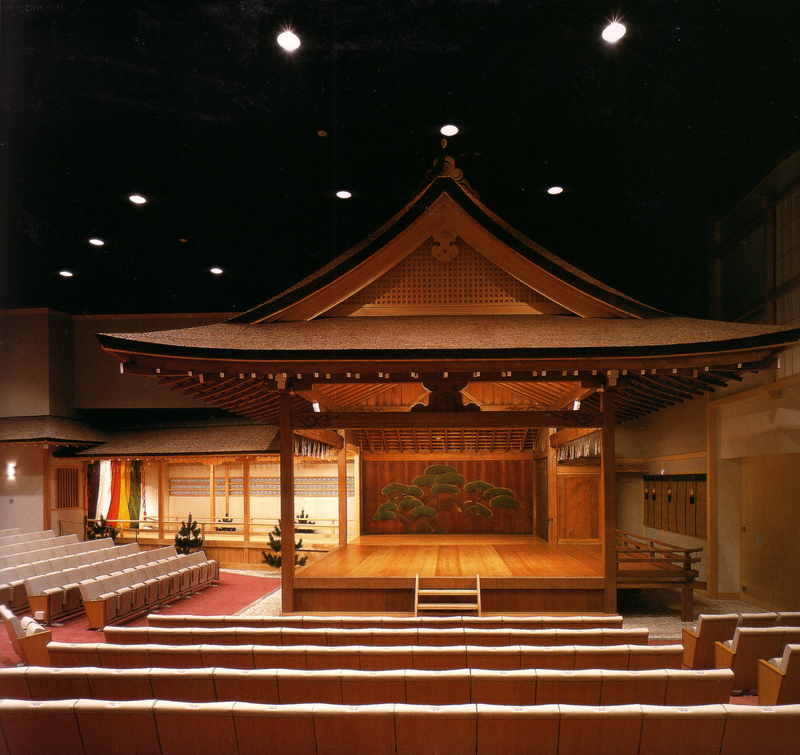 Noh actors do practice and perform recital, but their training and performance is not structured and regulated as in a Western-style conservatory. There is no ‘school building’ where all trainees report to in the morning. Most young professionals are either born into families of professionals, or become apprentices (uchi-deshi, or house-apprentice) to a professional. This means they either visit the home/practice space (the two do not necessarily coincide) of their teacher, or else they actually live in the home/practice space. This second option, called sumi-komi (live-in) is normal when the teacher is the iemoto or a high-ranking actor from an affluent family with a long heritage in the Noh profession, simply because these two figures are the only ones likely to own a stage as well as facilities big enough to serve the purpose of training disciples. An additional reason is that proximity to the origin of tradition (i.e. the iemoto) is likely to provide the ‘purest quality of technique’, as opposed to learning from another teacher, whose style will be similar but different from that of the iemoto. Finally, learning directly from the iemoto allows a performer to… well, claim that he/she has learnt directly from the iemoto: it is pedigree. For example, my teacher (Udaka Michishige) was uchi-deshi of the previous iemoto (Kongō Iwao II), which means he had direct transmission, while I am removed by one degree. In a small school like the Kongō school, undergoing an uchi-deshi training period with the iemoto is the only way to ensure a young actor is exposed to all the necessary kinds of knowledge he/she will need in order to become a full professional. I feel like I have made things more complex than I intended to – feel free to ask for clarification if you need to! Posted on 16/01/2014 23/05/2014 Categories TrainingTags Iemoto, Kanze school, Kongo, ryu, school, training1 Comment on School or ryu?